SAN MARCOS, Calif. – Baja Designs, “The Scientists of Lighting,” has introduced the newest member of the OnX6(tm) light bar system family – the Arc Series. The OnX6 Arc Series is an evolutionary development from the base OnX6 line, delivering Baja Design’s legendary lighting performance, but incorporating a stylish, arced design to complement design curves of the grilles or windshields of today’s light trucks. Three versions are available: Wide Driving – for dust or fog conditions, featuring a 42° horizontal pattern for close and medium range visibility; High Speed Spot – featuring a 6° spot pattern for distance visibility; and Driving/Combo – with a High Speed Spot segment flanked by Wide Driving segments for fully balanced near-field and distance lighting coverages. 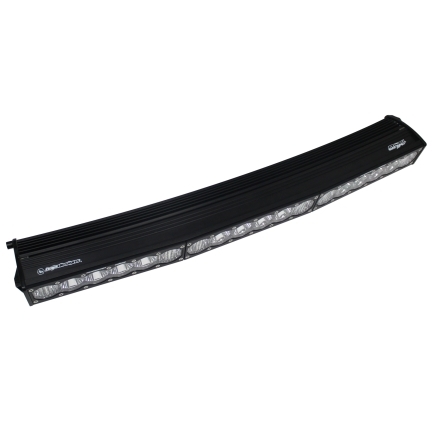 The 30-inch OnX6 Arc Series light bar produces an impressive 22,050 lumens. Amber lens kits are available in the Wide Driving and Driving/Combo versions for increased visibility in dust, fog or snow. 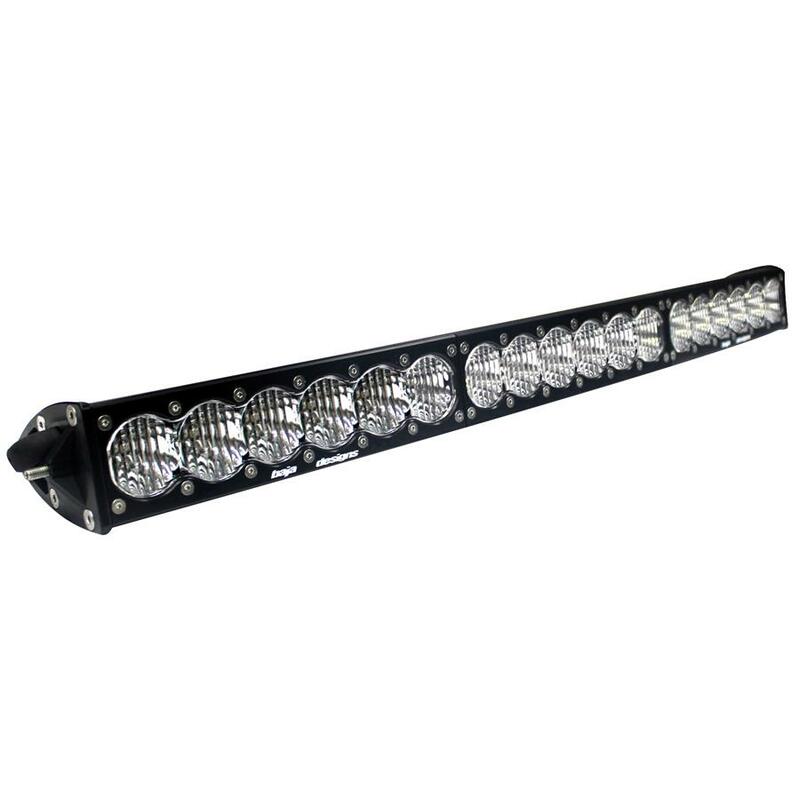 All of the Baja Designs OnX6 Arc Series light bars feature Baja Designs’ exclusive MoistureBlock(tm) technology and the industry’s only anodized aircraft-grade aluminum extruded housing, with a CNC-machined billet anodized billet aluminum bezel. The included mounting brackets are made of corrosion-proof 316 grade stainless steel and utilize stainless steel fasteners. All lenses are made of replaceable, high-impact, hard coated polycarbonate material. The lens/reflector assemblies are O-ring sealed, and are submersible, waterproof and dust-resistant. At the heart of the OnX6 family of light bars is the 5000K (5000° Kelvin) LEDs which produce a natural Daylight color temperature – easy on the eyes because they replicate the sun at Noon with zero cloud coverage. 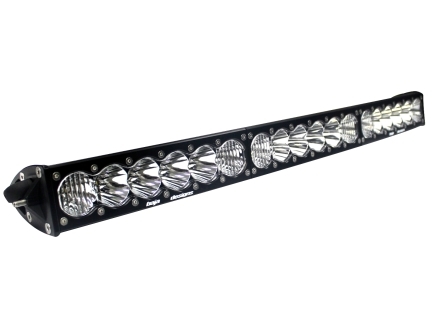 The LEDs and Baja Designs circuit board design deliver an industry-leading 49,930 hour life span, ensuring this is the last light bar you will ever have to purchase. Like all Baja Design lighting systems, all OnX6 light bars meet and exceed several stringent testing standards – MIL-STD810G (Mil-Spec Testing), IP69K (waterproof up to 9 feet, pressure washable) and are IK10 Compliant (Mechanical Impact Testing). The CopperDrive(r) circuity features built-in over-voltage protection, and are one of the only LED light systems driven at 100% capacity. The Baja Designs uService(r) Replaceable Lenses and Optics provide a light bar which are totally serviceable in the field.